The OzHarvest CEO CookOffTM is a magical event in the lives of vulnerable men and women in Australia. The 2019 event will be held in Sydney on Monday, 25th of March. The CEO CookOff feeds and entertains over 1,400 people in need, whilst providing an opportunity for Australia’s top bosses and their staff to lead by example in service to Australians who face food insecurity. In the lead up to the event participants raise funds in support of OzHarvest, with the goal of raising $3 million, which will provide 6 million meals to people going without all around Australia. It’s a healthy competition among the business leaders and their staff with a great a cause, and lots of fun! WHO CAN PARTICIPATE IN THE OZHARVEST CEO COOKOFF EVENT? CEOs, Managing Directors and Senior Business Leaders can register to attend and participate in the OzHarvest CEO CookOff event. And for the first time, teams can now register along with their boss in groups of 5. Whether it’s the Executive Assistant, Social Media Manager or IT Guru, participating in the CEO CookOff with your team is a shared experience like no other. Individual entries are still open and encouraged! As with previous years, you’ll be grouped with a selection of your business leader peers to form an incredible cooking crew on the night. WHAT IS THE FUNDRAISING TARGET IN 2019? In 2018, we raised over $2 million! Our 2019 fundraising target is to hit $3 million to support OzHarvest's purpose to Nourish Our Country through food rescue, nutrition education and hospitality training for disadvantaged youth, and community engagement programs. For every $1 invested in OzHarvest, we can deliver 2 meals to someone in need! WHY SHOULD I GET INVOLVED? WHY IS IT IMPORTANT? 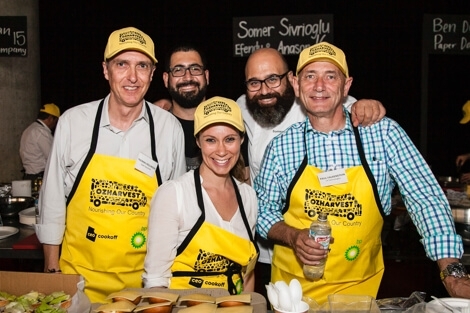 The OzHarvest CEO CookOff offers a wonderful opportunity to connect and learn a few new tricks from celebrity chefs as well as network with CEOs, Managing Directors, Senior Business Leaders and peers from across all industries. IS MY CEO COOKOFF REGISTRATION AND PARTICIPATION FEE TAX DEDUCTIBLE? Yes. If you are participating in the event or fundraising on behalf of your company, the amount paid is fully tax deductible. DO I NEED TO KNOW HOW TO COOK TO PARTICIPATE IN THE CEO COOKOFF EVENT? No! The cooking component of the evening is all about teaming up celebrity chefs with CEOs, Senior Business Leaders and their teams to cook for guests from the charities that OzHarvest delivers food to daily. Our invited dinner guests include homeless people and disadvantaged Australians - vulnerable men, women and children doing it tough. Your celebrity chef will guide you through the cooking process. Absolutely! Our aim is to raise $3 million dollars allowing us to deliver 6 million meals! Through your participation in the CEO CookOff and your reaching out to your network to support the work that we do we will achieve our goal! We ask you to set a great, big, enormous goal of raising $10,000 as an individual or $10,000 per person in your team, that’s $50,000 for a team of 5, which means you can sleep so well at night knowing that you have enabled us to do all of the truly amazing things above! We've prepared a handy pack of fundraising tips that will set you up for success and help you achieve your goal. You will also be prompted to pay a registration fee of $1,500 for an individual CEO registration or $7,500 for a team of 5 to attend the Sydney event. WHERE WILL THE CEO COOKOFF EVENT TAKE PLACE? Our 2019 event will take place at the Royal Hall of Industries (1 Driver Ave, Moore Park NSW 2021) in Sydney on Monday 25th March. If you are attending the event, there will be a number of activities for participants to partake in on the evening. Groups of five will partner with a celebrity chef and under their guidance, cook for approximately 30-40 people. Participants will be asked to assist with the preparation of meals and service of food for dinner guests. An important aspect of the event is dining and sharing a meal with our guests – vulnerable, disadvantaged and homeless Australians attending the event. WHAT TIME MUST I ARRIVE ON THE NIGHT? CEOs and participants arrive at 5.00pm. HOW CAN STAFF MEMBERS GET INVOLVED? For the first time, teams can now register along with their boss in groups of 5. Whether it’s the Executive Assistant, Social Media Manager or IT Guru, participating in the CEO CookOff with your team is a shared experience like no other. Invited team members can set up their own fundraising page and collect donations through it to help your company team reach its target. Get your staff involved by putting the call out for a company bake sale or an internal CookOff. We'll be providing you with a fundraising toolkit with lots of ideas on different ways to engage your staff. OzHarvest is the first perishable food rescue organisation in Australia collecting quality excess food from commercial outlets and delivering it, direct and free of charge, to more than 1000 charities providing much needed assistance to vulnerable men, women and children across Sydney, Adelaide, Brisbane, Canberra, Gold Coast, Melbourne, Newcastle and Perth and regional areas. With a purpose to Nourish Our Country, OzHarvest is a leader in addressing food security and education through their innovative nutrition education sustenance training program NEST, hospitality training program Nourish assisting vulnerable Australians and disadvantaged youth and through community engagement activities. The innovative food rescue organisation tackles global food waste and is the official partner of the United Nations Environment Programme (UNEP) and United Nations Food & Agriculture Organization (UNFAO) Think.Eat.Save campaign and was awarded the 2013 United Nations’ World Environment Day Community Award. 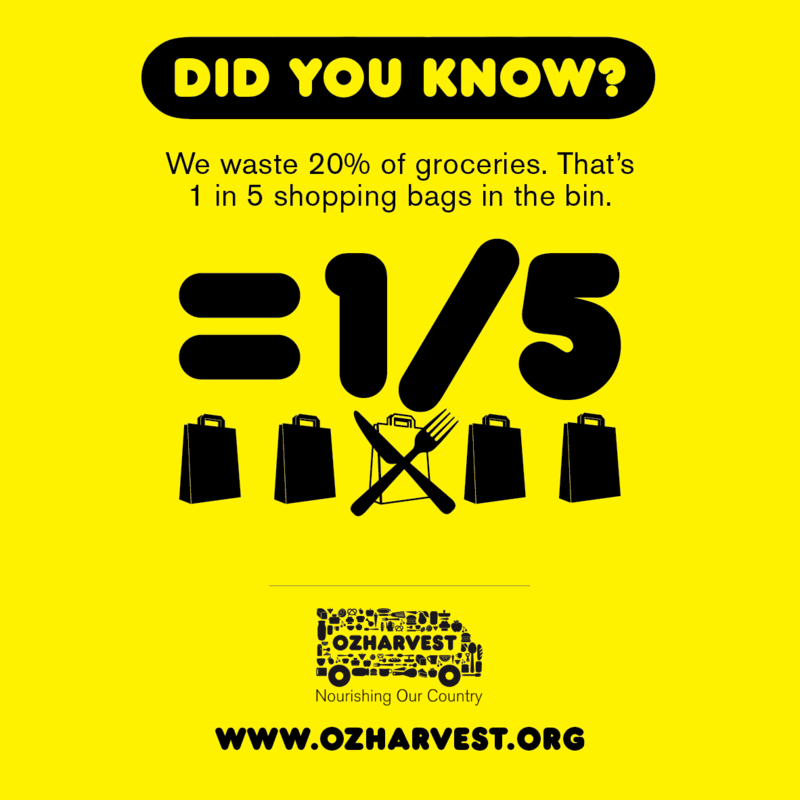 Every $1 donated allows OzHarvest to deliver two meals. 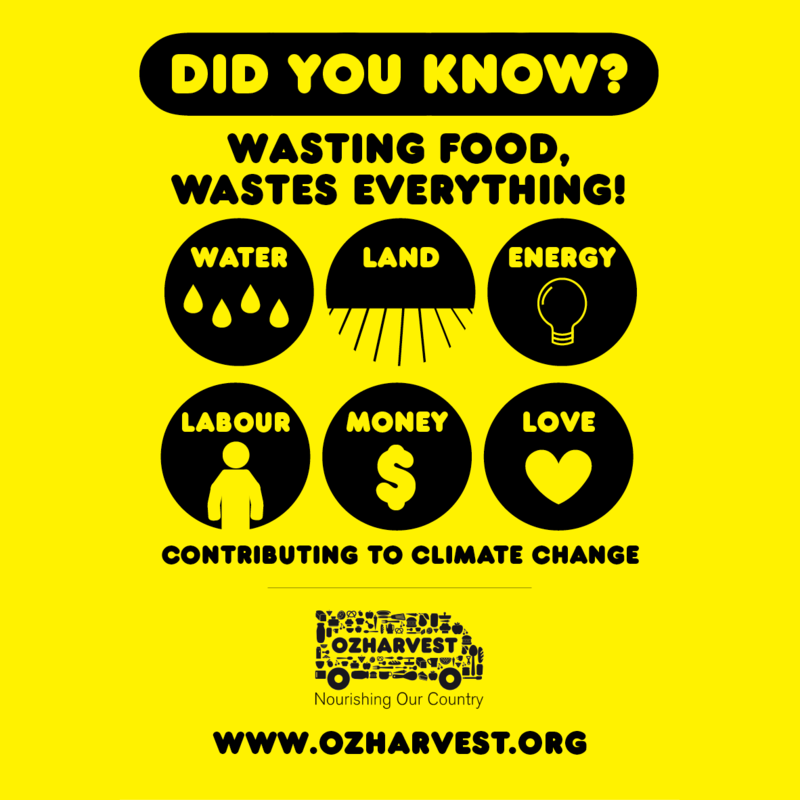 Find out more on OzHarvest at our website.